Your Mac will serve better with regular optimizations and diagnostic checkups. Running them manually might be weary, but the Maintenance module does all the hard work for you. Open the Maintenance module and click View All Tasks. Then, look through the list of available tasks and their last run date. Choose appropriate tasks. Please carefully read and follow the recommendations below to prevent system lag under high workloads. Note that it is not necessary to run all tasks at once. RAM keeps the information that is being processed by your system and applications. Generally, it helps speed up completion of operations, but as the amount of data stored in the memory grows, your Mac may become slower. Run this task whenever you feel that your macOS or apps run slower than usually. Maintenance scripts are basic system routines that macOS runs on daily, weekly and monthly basis. These scripts are aimed to keep your Mac in shape. 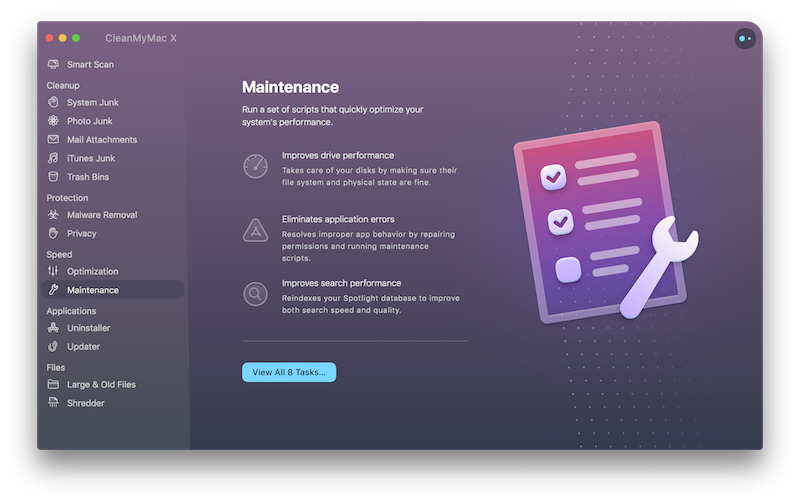 Good to run every day: running maintenance scripts is fast and won't compromise your Mac’s productivity. Every file and folder has a set of permissions that determines the types of actions you, system, applications, or other users can perform with it. If permissions are getting corrupted due to, for example, improper system shutdown or incorrect changes made by the app during its installation, you may face some access- or performance-related issues. CleanMyMac's Repair Disk Permissions task verifies current permissions and restores correct ones to ensure proper functioning of the Mac system and applications. Verify Startup Disk is not available on Macs with Apple File System. The Verify Startup Disk task checks the file system on your main disk to make sure all data is solid and safe. If the disk needs repairs, CleanMyMac provides you with appropriate instructions on using Mac's Recovery HD functionality. If you have disks, other than the startup drive on your Mac, you will be able to verify and repair them right within CleanMyMac X. For now, Speed Up Mail is not available on macOS Mojave. The Speed Up Mail task reindexes macOS Mail envelope index database to resolve widespread message content issues, improve performance, and search speed. Reindexing is a safe and useful procedure that doesn't affect your emails. The Finder uses the Launch Services database to keep information about file types and applications assigned to open them by default. As you install, remove, or update applications, the database may become corrupted and cause some troubles with opening applications or with displaying correct contents of the Open With menu (control-click any file and choose the Open With command). Use the Rebuild Launch Service Database task to resolve these issues. The Reindex Spotlight task initiates a complete reindexing of your Mac’s main search engine to improve its performance and accuracy. Generally, Spotlight indexes itself automatically, but after working with a large number of files or after a long period of service it may need help. Please mind that Spotlight reindexing is rather time- and resource-consuming procedure that will keep your Mac under a high workload until the task is completed. During this period, Spotlight won't be available, but it will work perfectly for you afterwards. macOS keeps a local cache of resolved Domain Name System (DNS) requests during the period defined by the DNS server. In some cases, you may need to reset the cache immediately and get new DNS records. For example, after an entry on the DNS server is changed, or a new entry is added. Time Machine is a reliable backup feature that keeps all your files (including music, photos, apps, and so on) safe even when something goes dramatically wrong. Still, its local backups, a.k.a. snapshots, may occupy dozens of gigabytes of space on your Mac. Run this task once in a while to shrink the size of your Time Machine backups without affecting their contents.